Sophie Hannah's crime stories (set in and around Spilling and featuring detectives Charlie Zailer and Simon Waterhouse) are unusual in several ways. First, though set in small English towns, they're hardly cozy: She mines the darkest corners of suburbia like few other writers have been able to. Second, her running characters are frequently at the fringes of the narrative rather than at the center. I've missed the past couple of Zailer-Waterhouse novels (there are seven in all, and I quite enjoyed the first 4). They require a certain amount of attention to appreciate all that is going on, and therefore a certain commitment of time. But once started, the books pull the reader in and on (and I will certainly go back and fill in the taps in my Sophie Hannah reading). 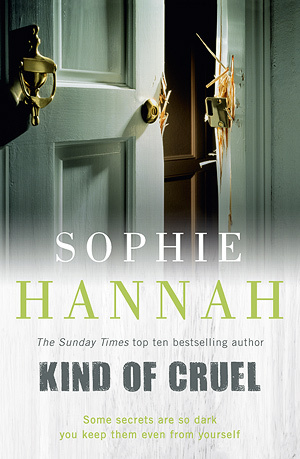 The new book, Kind of Cruel, combines mystery, tension, character, and comedy in a way that Hannah's readers have come to expect. And in this one, the humor grows out of not only the running characters (Zailer and Waterhouse are spiky and interesting but the other cops are distinctly characterized and frequently but usually unconsciously funny, not to mention Charlie's sister), but also in the central character of this story, Amber Hewerdine, who is acerbically intelligent and does not suffer fools at all. Other characters who are at the center of the various threads (and sometimes are the narrators of those threads) include a sincere hypnotherapist, Amber herself, and various members of Amber's numerous and distinctly odd extended family. Amber and her husband Luke took in the daughters of her best friend when the friend was murdered by an arsonist, and in the midst of working out this instant family, Amber is suffering chronic insomnia. When she visits a hypnotherapist for help with the insomnia, she meets an annoying fellow patient and kicks off a series of events and encounters that will eventually illuminate several cases that the police have been unable to solve. Waterhouse seizes upon Amber as a witness, though her relationship to the crime he's investigating is sketchy at best, and his superior officers are displeased (not an uncommon situation for Simon). Zailer is no longer working directly with the CID, and her involvement complicates (rather than simplifying) Simon's relationship with his fellow officers (not least because she and Simon are now married, their own relationship itself quite odd). The story is quite complicated, requiring some repetition of facts and relationships as various characters involve themselves in various ways, but the repetition creates a spiral within the narrative rather than bogging it down. The voice of the hypnotherapist is an intrusion of psychotherapeutic ideas that are mostly helpful, even if a reader might find therapy-talk in general a less-than-entertaining mode. The psychotherapy is in the end necessary to the story, because the motive, especially, is quite complex. Without the therapist, the impulse behind the crimes might not seem credible, but from the hypnotherapists point of view, everything finally comes together in a convincing, but very dark way that gives a realistic but perhaps pessimistic coda for the troubled family relationships that have been the subject of the novel all along. One word about cover art. 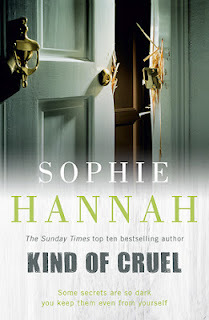 I think Hodder has done a great job with the covers of Hannah's series, suggesting the domestic interiors that are not simply the setting for the series but the zone of both safety and horror lurking in the characters' lives. Great to see a reviewer comment on cover art. I think this is one of her better ones, but have to say I did not find either of the murders "convincing" in the least, particularly the first, which could easily have been avoided by the murderer simply going away and coming back another day. A curate's egg, is my view of these books - well written but frustratingly convoluted. The police station aspects are dreadful. Amber is a vivid character, one meets people like her in England not infrequently!